Market 8 Updates and How We Became Specialists. A lot has happened lately at Market 8 in terms of our offering and with the unvealing of this at the INBOUND14 conference last week, this time (and this time only - promise this kind of updates will be kept to once per year max) we’d like to bring you up to speed on what has transpired lately on Market-8-land.. I started this company back in 2008 with the idea that we could offer full service Inbound Marketing to SMB’s. Over the years, and specially since the big recession, we saw how buying behaviors, at least for a large portion of the B2B market, shifted gears completely. B2B buyers became more inquisitive, more research oriented, and websites and inbound marketing started playing a bigger role in all B2B purchases. With these buying behaviors changing, also the way in which websites are seen changed radically. Basically websites became subjects of the same level of scrutiny that advertisement suffered in the last decade... lack of customer focus and authenticity made traditional websites be more a useless asset, and even a barrier, when they needed to be a sales tool. So we started looking at websites differently. As salespersons. We thought that indeed, websites will never replace a live salesperson, but websites can certainly do a lot of what great salespersons do. We also started experiencing the virtues of specialization as an agency, becoming more and more focused on creating websites; really, really good websites, that can help companies sell more. To make this happen we developed a Customer-Centric methodology that involves studying the end client’s buying process, the companies’ sales processes, and then adapting websites to support these. 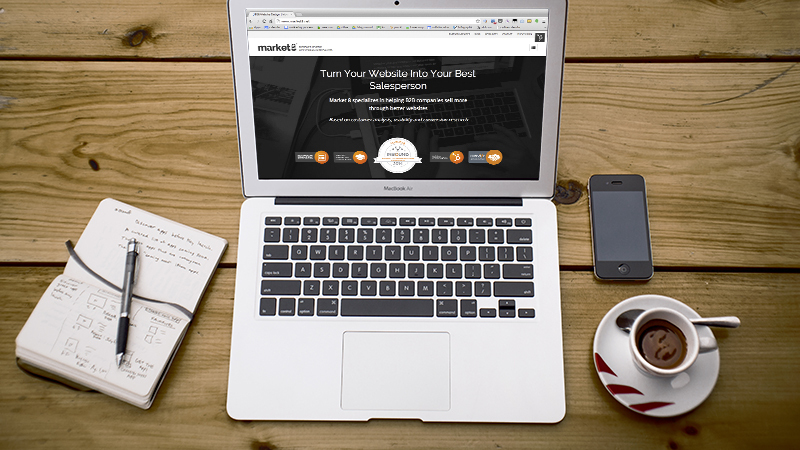 So at INBOUND14 we unveiled our new website and our new focus on creating websites that can help companies sell more. We no longer offer retainer-based Inbound Marketing solutions, Market 8 is now fully focused on helping companies first figure out their sales process, and then building websites that support that sales process. As part of this renewed focus on websites, we also created a great template and a framework for companies with smaller budgets and with the brains to follow more of a DIY approach to building their own website. So we created what’s now the best selling website template in the HubSpot template marketplace, Simplex CORE. In celebration of INBOUND14, we held sweepstakes to give one lucky winner a chance to walk away with our most advanced template for the HubSpot COS: Simplex CORE. We had many people fill in the landing page and we held a raffle at the end of INBOUND to select the winner. Today we’re proud to announce that the winner of the sweepstakes is Martha Madero from DB Digital. Congrats Martha! If you didn’t win or didn’t get a chance to even participate, you can still benefit from the INBOUND14-mania. Anyone who purchases our Simplex CORE template will also get a free Basic Personalization package valued at $500 for free. The Basic Personalization includes helping you set up a global header and footer module, modifying the logos, and modifying the colors to fit your brand. This offer is for a very limited time and will expire on Friday October 10, 2014. So hurry up if you want to benefit from your Free Basic Personalization Package on your Simplex CORE Purchase. This year, Market 8 was the super-proud receiver of the COS Performance Award for International clients. What this means is basically that the sites we have built in the international arena have the best Marketing Grader scores of all sites built by any other HubSpot partner, which is amazing (blushing a bit). We continue to be committed to building awesome websites focused on helping your company sell more, so this recognition is actually great news for you too. It gives you some reassurance of the quality of the advice coming from this blog, or the quality you can expect when eventually working with us. That’s all for the moment as far as company updates. We’d like to invite you to check out our new website and tell us what you think. As always, your insights will help us improve to fit your needs better. We learn through our conversations with you.